We have a suite of Makerbot 5th Gens at our College and out of the box they worked great. However, being in high-traffic, high-use environments with students from Year 4 to Year 12 utilizing these 3D printers we started to have maintenance issues spring up on almost a daily basis. Through trial and error, reading forums and talking with MakerBot tech support and the guys at ThingLab, we know have our printers fully optimized and printing better then ever. Be vigilant about dust – you need to keep your 3D Printer as dust free as possible which may mean investing in a dust cover for when it is not in use. Firmware should be updated regularly. Latest version is v1.6.3. This can be updated from Devices -> Update Firmware. 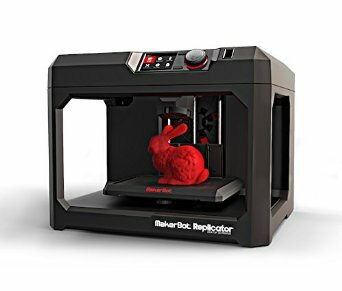 Ensure you are using the latest version of MakerBot Desktop. Print and make a dust filter or universal filament filter available from Thingverse – trust me this makes a huge difference! This video explains the fitting and you can also try a little WD40 in the filter. Check the PTFE (white tube) is in a nice arc, just touching the rear edge of the filament drawer and that the end sits between the two lines marked on the filament drawer. Leave your filament drawer in the upright position whilst printing. Instead of blue painters tape on the build plate consider using Buildtak. It is a much better alternative. Level the build plate, ensuring that you tighten the two bed levelling screws before calibrating. Once the procedure is complete, perform levelling again, skipping the screw tightening at the start. This will ensure the plate is very level. Go back and now offset the plate to +0.4mm, apply changes and run a test print with ‘Chain links’. If the raft is ‘squiggly’, incrementally adjust the smart extruder up till it no longer is running test prints to check the first layer. As soon as it adheres well (no squiggles), this is your Z height. Once the plate is level, take the plate out to remove parts and you won’t tamper with the level. The printer will then check the level between prints to ensure that it’s still level. In all the excitement that 3D printing generates at your school, eager students may bump the printer on occasions so re-levelling fairly often is recommended. As students are learning CAD, it is also important to check their designs for size, shape and form and talk to them about what would print well, what wouldn’t and why. All part of the fun!